It was D's cousins little girl's 1st Birthday a few days ago, and I wanted to make her something little, but also something that she could keep in her room for a good few years and wouldn't outgrow too quickly. 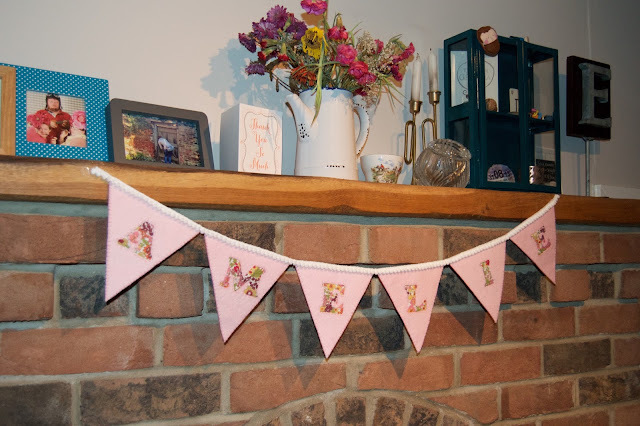 So, I reverted to an old favourite of mine and made her some pink floral bunting with a fun pom-pom trim! 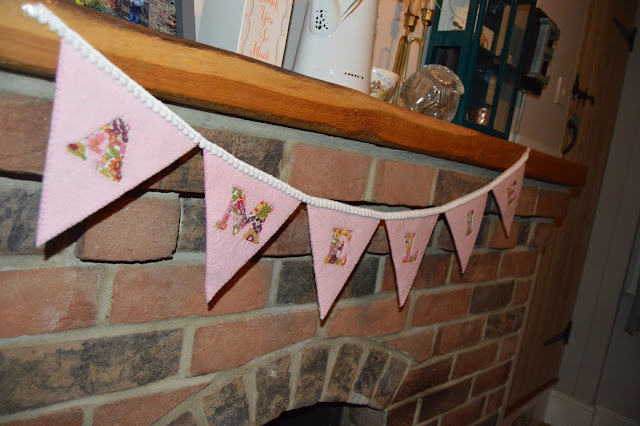 Bunting has been done a million times over, and I think most people are kind of over it, but I still think it's cute, and I did try a new technique, which probably has a real name but I just sort of made it up as I went along! I made pink felt triangles for the front of the flags, and white triangles for the backs, then cut the letters out of the pink triangles. I bought a fat quarter of this pink and purple floral fabric a while ago, and I thought it would be great as its pretty, but not too young! 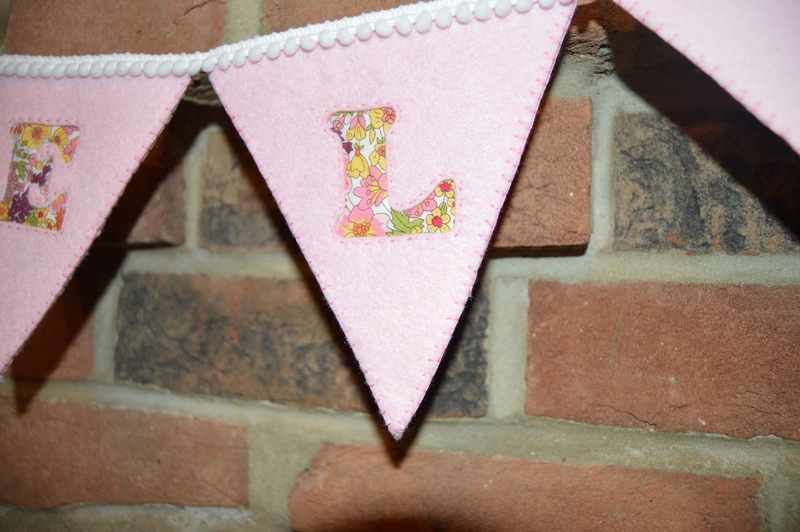 I cut out some little pieces and used tiny stitches to secure them to the pink felt so the pattern showed through the cut out letters. 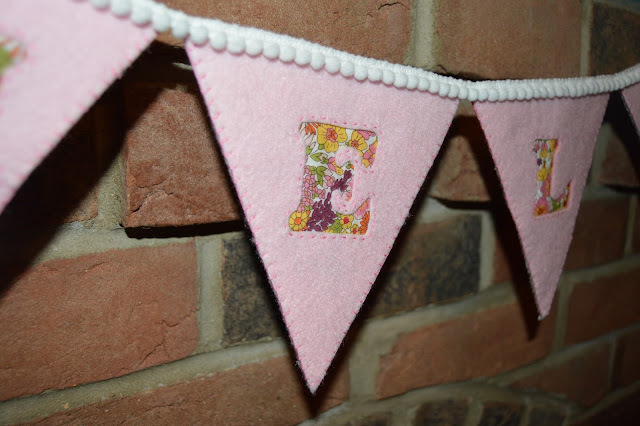 I then attached the white felt backs (to hide the stitching and the back of the floral fabric) with pink blanket stitch, and stitched each flag onto the pom-pom trim! I really like how this ended up, and really enjoyed hand sewing something for a change! 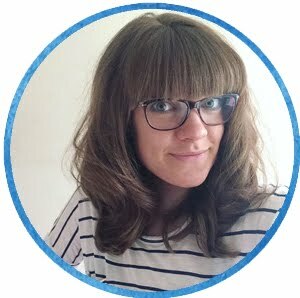 I'm told that it went down well with Amelie too and that it's already hanging in her bedroom! Perfect!